Delivery drivers should be kept up to date with relevant information on the site they are attending. Specific localised issues should be identified and communicated to delivery drivers, to ensure the safety of pedestrians and cyclists within the community. If possible, delivery routes and times should be agreed at the start of the project. Clear map information was developed to identify safe routes and highlight cyclist danger hotspots on local roads. These were displayed at the site entrance on hoardings and handed out to all delivery drivers to ensure a greater awareness of the dangers and issues to cyclists and pedestrians in the locality. When a project has come to completion, the contractor can rest assured that they have left the neighbourhood on a good note, which impacts on their public relations and potentially on future job allocation. 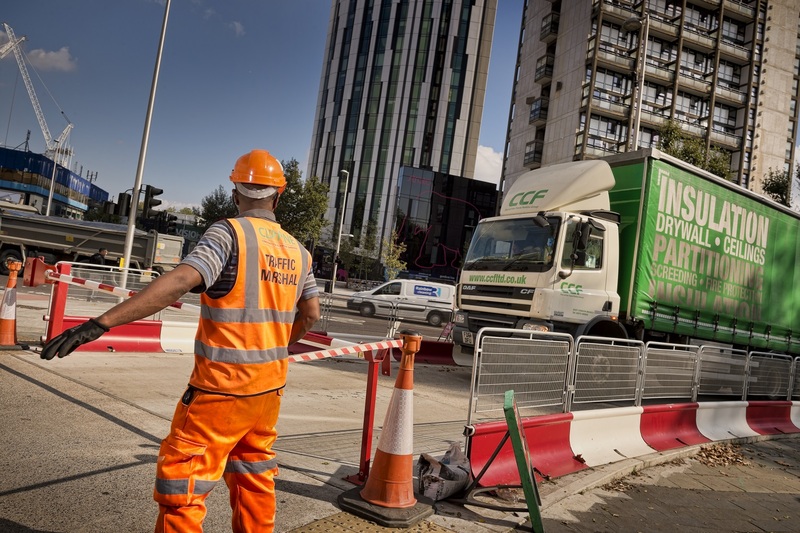 Considerate Constructors Scheme, Site Registration Examples of Good Practice Brochure, 2014; Monitor Report, John Sisk & Son Ltd, Reading, November 2014. Impact on local traffic and parking is perhaps the biggest cause of frustration with the construction industry. Proactive management and communication will avoid, or at least minimise this, by keeping the public up to date regarding site traffic. Public highway works are also major sources of public irritation and complaint. If possible, road closures should be shared with utilities to avoid multiple closures. Numerous additional cars parking nearby will inevitably have a negative impact on neighbours.